Need more information about booking Home 9374763 ? 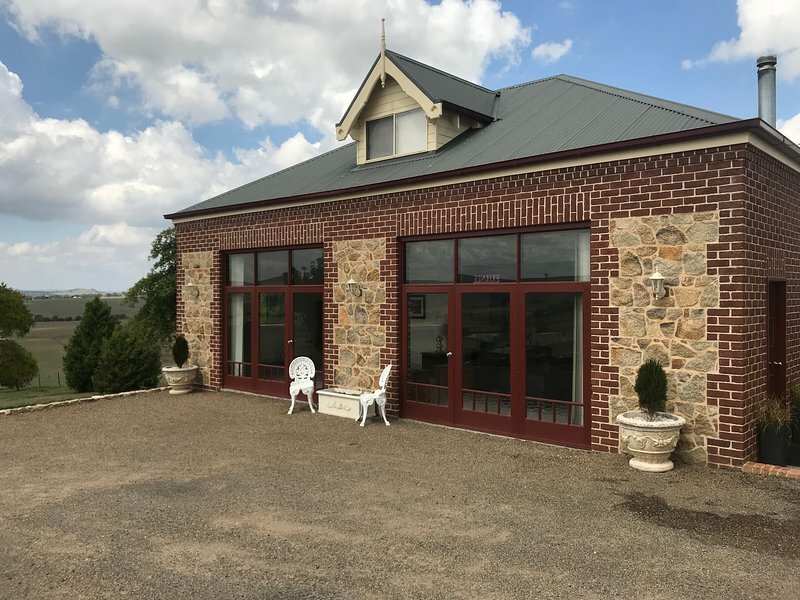 Arabella Guest House is a beautiful, quite relaxing 2 bedroom home, located on 100 acres in Parkesbourne, just 15 minutes from Goulburn and 50 minutes from Canberra. All roads to the property are sealed. The house is perfect for Families, Honeymooners or groups of friends wanting to try a Tree Change or just get away from it all. It is fully self contained, with all the comforts of home, and also has a heated pool where you can soak up some sun in the warmer months, or you might just want to sit back with a good book and a glass of wine and enjoy the scenery. The house consists of 2 bedrooms over 2 levels. The main bedroom, kitchen, bathroom and living areas are all on the ground floor, with the second bedroom taking up the whole floor upstairs. The property has many friendly animals which you can hand feed at feeding times if you would like, or just watch the owners do the feeding. There is plenty of little country towns around the property that you can visit as well as many great coffee shops nearby in Goulburn. Or if you want a shopping fix the Canberra DFO shopping centre is only 1 hour away. You can get in touch with Tania (the owner) through the contact form on this page. Send Tania (the owner) an email through the contact form on this page. Alternatively, if there’s a phone number on this page, you can call them. How do I contact Tania (the owner)? If you’ve already booked, go to Manage your holiday booking to view Tania the owner's contact details or send them a message. Or send Tania (the owner) an enquiry through the Contact the owner/manager form if you’d like a quote or more info first. When you pay online through the Book your stay form, a booking request is sent to Tania (the owner). You’ll find out within 24 hours whether they’ve accepted - no money will leave your account before then. You can also request a quote from Tania (the owner) through the contact form. The owner will email you the total cost for your dates and a link to book and pay online. Use the Book your stay form to pay provisionally online. You can pay by credit/debit card or PayPal. Tania (the owner) will have 24 hours to accept the booking and no money will leave your account before then. Why can't I call Tania (the owner) before booking? You’ll need to contact Tania (the owner) to do this. Send them a message in Manage your holiday booking or through the contact form on this page. You can request to change the dates or number of people on your booking via the Manage your holiday booking page. To change your holiday dates use the Edit booking button. If you need to change the number of guests staying then send Tania (the owner) a message. If Tania (the owner) agrees, they’ll send you a revised quote outlining the changes. You can review and accept/decline this from the Manage your holiday booking page. You’ll have 48 hours to take action before the revised quote expires.